President Donald Trump was set to sign an executive order temporarily banning entry to the U.S. for people traveling from a number of predominately Muslim countries, according to a new report. The executive order was expected to be signed Wednesday and would be the latest campaign promise the newly sworn in president made good on during what has already been a busy first full week in office. Specifically, the U.S. will automatically block any visa held by a person traveling from any of the above listed countries. Also included in the temporary immigration ban are refugees. While the ban was expected to be temporary, it was not immediately clear when the ban would be lifted after it is enacted. However, Reuters reported the ban would likely stay in place until the U.S. immigration vetting process was overhauled to be more thorough. The executive action could present somewhat of a conundrum for the president, though it would not be against the law, a former immigration official told Reuters. Trump has had a busy first full week as president, starting almost immediately after his inauguration Friday. He has taken steps to repeal the Affordable Care Act, the national healthcare law and signature accomplishment of Obama that is more commonly known as Obamacare; he has severed ties with the Trans-Pacific Partnership (TPP), a trade deal between 12 countries meant to strengthen economic ties between North American and Asian nations; and he has ordered a federal hiring freeze aside from the military; he signed an executive order to reinstate the Mexico City Abortion Rule, which stipulates that a foreign non-governmental organization funded by the U.S. cannot provide abortions or promote abortion services. 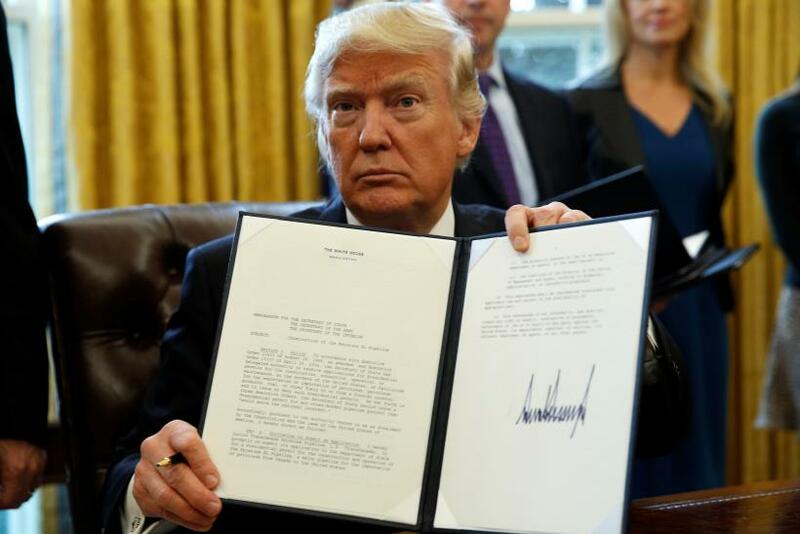 Trump also signed an executive order Tuesday to advance the construction of the Keystone XL and Dakota Access Oil pipelines, a blow to environment advocates. That was one day after Trump's administration announced the president planned to slash the budget of the Environmental Protection Agency.